The Maltese Cross dates back to the Knights of St. John and symbolizes their vows to live in faith and truth, to be humble and merciful and to fight for justice even if it meant enduring persecution for their faith. Made in fine-qualtiy, 14k solid yellow gold (back is polished plain, fully solid). Cross measures 3/4" x 3/4". Measures 1" tall with bail/hoop. Cross measures 1.5mm thick (depth). Also available as a 14k white gold maltese cross pendant. 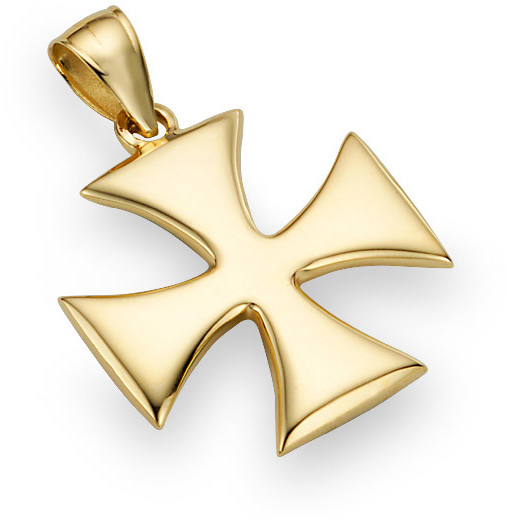 We guarantee our Holy Warrior Cross Pendant, 14K Yellow Gold to be high quality, authentic jewelry, as described above.